We got tired of using so many paper towels and went on the hunt for something better. There were some applications where sponges would work, others where a "rag" might work, but for the things we did every day at the shop and at home we were at a loss until... we were at a conference and spotted Skoy. The price was right, the pedigree terrific, and it met so many of our needs we were sold. So of course we want to share these with the world! 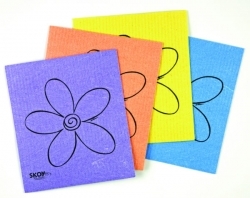 Package contains 4 Skoy cloths in a variety pack of colors with flower print (4 colors randomly selected from orange, yellow, green, blue, pink, purple, apple green, soft yellow) OR you can choose 4 Skoy cloths in a variety pack of colors (orange, yellow, pink, purple) with inspirational text (“smiles, spirit, fun, freedom, sun, friends, beach, love, laughter, life, energy). Each Skoy cloth is approximately 7″x7″. Use the pull-down menu to choose between two designs available from Reach And Teach. Our factory is aware of the responsibility for handling its resources carefully. We use renewable raw materials such as cellulose (derived from wood), and cotton to produce our Skoy cloths. Our factory has invested heavily in developing and implementing an integrated environmental recycling and disposal facility in which the economical use of energy and water is first and foremost. Production by-products are purified and recycled as far as possible within the process. Regeneration baths are returned to production by an evaporation process. Wastewater is treated at the site’s biological wastewater purification plants. This environmental concept is at the vanguard of operations-related environmental policy and has resulted in our factory becoming a reference company throughout the industry. Wet your Skoy Cloth before using. Be sure to squeeze out the excess water for optimal absorption. It can be used with popular household cleaners, but works just as well with water. Rinse cloth thoroughly when combined with dish soap in order not to leave residue. We recommend that after your Skoy Cloth has passed its prime, it can be used as a rag for heavier cleaning. 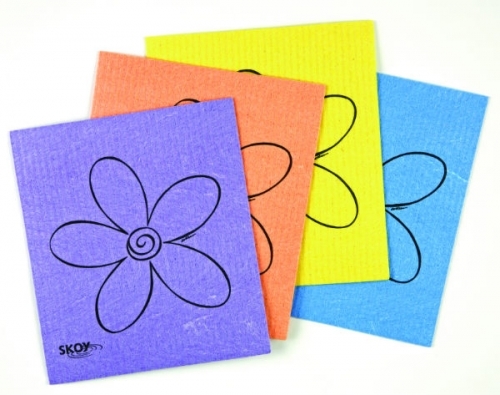 The Skoy Cloth can be cleaned in your dishwasher and is washer and dryer safe up to 90°C (190°F).